Back in the days of analog tape, archiving multitrack sessions was not an easy task. You needed a place to store the bulky tape reels, and if you didn’t “bake” the tapes to get the moisture out of them, they would deteriorate over ten or so years. With digital technology it should be a lot easier, right? We can make endless copies without losing quality, and rather than physical tape, we just have computer data. Our recording files are really just a bunch of zeros and ones. But we face a different set of problems in the digital age. Formats are constantly changing, and if you store something in only one format, you might not be able to read it in five or ten years. For example, those of us who stored MIDI sequences on floppy disks back in the ‘90s would be hard pressed to open them now. Or what if you used to record to ADAT? How could you load those sessions today? What complicates things further is that we don’t really know what the shelf life of our digital media is. Even if your computer could still read the data from a CD in 10 years, will that data be intact? We’re in uncharted territory, to some degree, and the only real way to protect yourself is through redundancy and variety of storage media. Ok, so enough of this theoretical stuff, let’s talk about archiving your music. DAW session files. 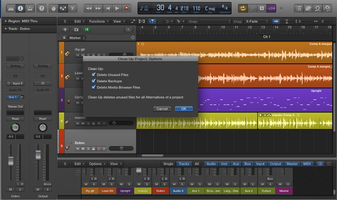 You want to be able to reopen your final mix, if need be, so you’ll need your DAW's native session file from your final mix, and for your alternate mixes. You can probably save space by getting rid of older versions of the DAW session files and old auto-backups. Flattened, dry DAW track files. You want to keep the audio files you used for the final mixes of the song. The problem, however, is that you probably have a lot more audio than that in each song’s audio folder. I would recommend going through each song and consolidating (aka “merging” or "flattening") the sound files so that you have only one full audio file for each track (starting at bar 1, beat 1 of the sequence) instead of a lot of fragments. I would also recommend saving these tracks as WAV files (if you DAW gives you a choice, save them as Broadcast Wave files, which have timestamp info embedded). When you copy the session onto your archive drive, the idea is to only copy the active, flattened audio files, not all the old stuff that ended up on the “cutting room floor” when you were mixing. You don’t need to keep all nine takes of the band playing basic tracks that you didn’t end up using, or the 75 takes your lead guitarist did before finally nailing that solo. Unless you think you might need those parts down the line, unused audio files will just make your archives a larger. 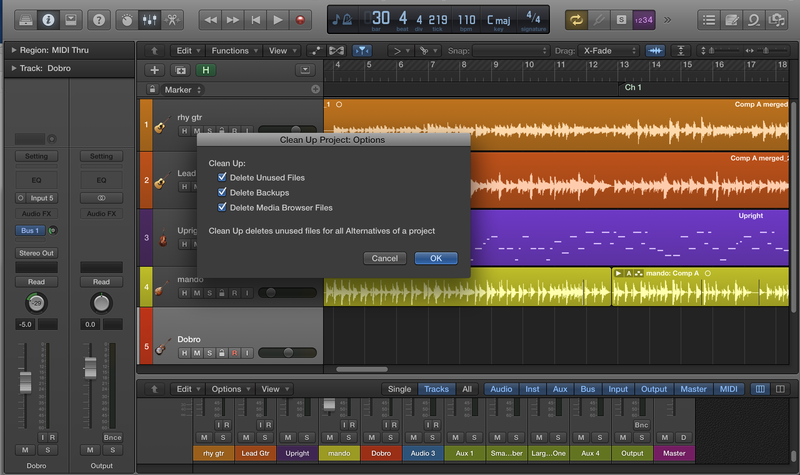 Your DAW may offer project management features, for instance, Logic Pro X's "Clean Up option," which let you get rid of unused files, or export only the active tracks to a copy of the session. 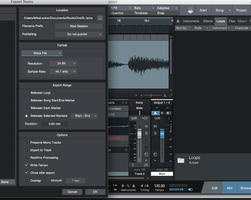 Individual track files with effects and automation. You also want a separate bounce of each track (in its entirety) with any effects and volume and pan (or other) automation left on when you bounce. These are sometimes referred to as “stems,” although stems can also be bounces of subgroups or other subsets of your mix. For this purpose, you should solo each track and bounce it individually, so that if you could reassemble your mix by just placing all the stems at the first bar of a DAW session, and hitting play. You want to make these stem bounces stereo, even if the source track is mono, because any stereo effects like reverb need to be included. Most DAWs default to a stereo bounce, anyway. Some DAWs, such as PreSonus Studio One 3 and Apple Logic Pro X let you bounce all your individual tracks as stems in a single pass, which is definitely a time saver. Having both unmixed, flattened audio files and stems from the mix is important, because your DAW’s native file format might not be around in 10 years. 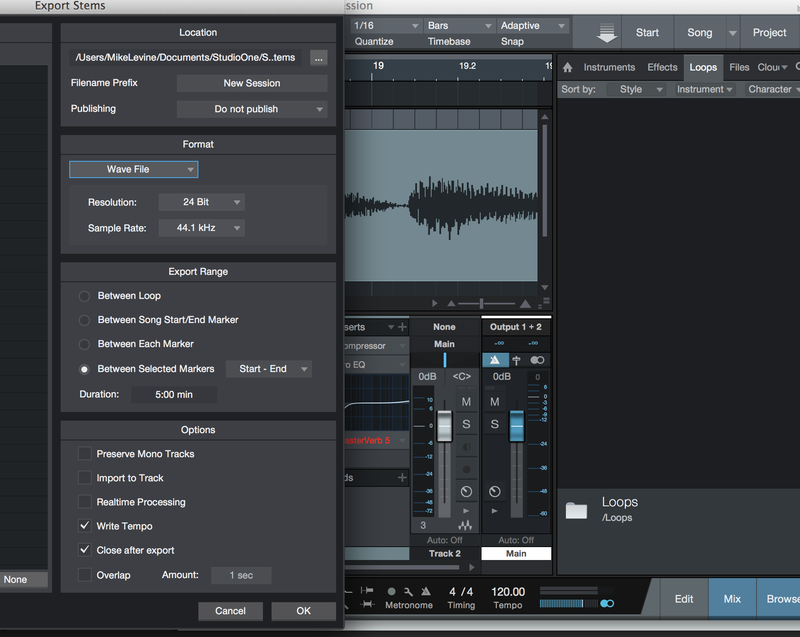 What if your DAW no longer exists? You want to be able to reopen your sessions if necessary. All Mixed Files. Your archive should also contain a stereo file of your final full mix. You should also create several types of alternate mixes for your songs, including an instrumental mix, TV mix, acapella mix and so forth, during the mix process. See this article for more about what’s comprised in each of those mix types. As mentioned in the intro to this story, the challenge of archiving digital music files is twofold: First, formats change constantly. You want to make sure that whatever you archive to will be readable in the future. If you back up to DVDs, will you be able to read them in the computer you have in 10 years? Probably not. Second, we don’t know what the shelf life of our storage media is. We do know that all hard drives (other than maybe SSD drives) are going to fail at some point. So what’s the answer? As with any backups, redundancy is key. I would recommend you get a large archive drive and an equal sized backup, and that you backup your archives to a cloud-based storage service, such as Dropbox. If it were me, I’d get a USB drive, because USB offers backwards compatibility. That is, older USB drives can still work with computers that have newer ones. So your USB2 drive will work on a USB3 computer, and, theoretically, any future versions. I wouldn’t recommend using DVDs for your offsite backups, because the format is already in decline, and you may have a hard time reading those disks in several years time. You should also expect that you’re going to have to migrate your archived files at some point in the future as formats change. When it appears as if the current storage format you’re using maybe disappearing, it’s time to move your files to a new medium. This might seem like a lot of work for songs that you may or may not want to revisit down the road, but if you want your music to be preserved for the long haul, it’s smart to archive.